The 2017 edition of “The Muslim 500” — an annual list of the world’s most influential Muslim people compiled by the Royal Islamic Strategic Studies Centre in Jordan — includes eight individuals from the sports realm. Seven of those eight are incumbents from the 2016 list. 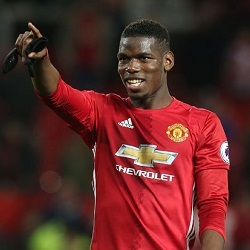 The new addition is French soccer star Paul Pogba, who plays for Manchester United in England’s Premier League. 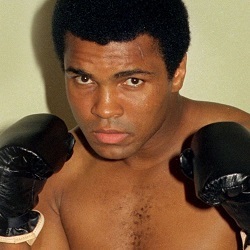 He fills a spot that was left open by the death of boxing legend Muhammad Ali last year. There are 13 categories in which individuals on the “Muslim 500” list are placed: Scholarly, Political, Administration of Religious Affairs, Preachers and Spiritual Guides, Philanthropy/Charity and Development, Social Issues, Business, Science and Technology, Arts and Culture, Quran Reciters, Media, Celebrities and Sports Stars and Extremists. He is followed on the list by the king of Jordan and the king of Saudi Arabia. Receiving an Honorable Mention for the top 50 is track and field star Mo Farah, the 33-year-old who won two gold medals at the 2016 Olympics in Rio. Winning the gold in the 5000m and 10,000m at the 2012 Olympic games in London and the 2016 games in Rio, Mohamed ‘Mo’ Farah is the only British athlete to have won four Olympic gold medals on the track. Born in Somalia but raised in the UK from the age of 7, Mo has captured the hearts of the British public with his hard work, success, smile and warm personality. He is a popular role model to follow for people from all over the world, especially in the Muslim world. He was awarded a CBE in 2013. His winning celebration, the ‘mobot’ is mimicked internationally. Touré is one of the world’s best footballers and currently plays for Manchester City. He has previously played for elite clubs like Monaco and Barcelona. When awarded the traditional bottle of champagne for a match-winning performance, he gave it away stating that as a Muslim he didn’t drink alcohol. This prompted a review of such awards, and he now receives shields for his awards. In October 2013, Tour joined a campaign against elephant poaching, becoming a goodwill ambassador for the United Nations Environment Programme. Tour was also nominated in the Personality of the Year category at the 2014 MTV Africa Music Award. Commanding a staggering £89 million, Pogba currently holds the title of most expensive footballer in the world. A talented midfielder for Manchester United and France he was also named as Best Young Player at the 2014 World Cup after some impressive performances for the French National Team. Pogba was born to Guinean parents and is one of a growing number of European Muslim football players who rank amongst the best in the world. Zinedine Zidane is a French footballing legend of Algerian descent. Born in a poor neighbourhood of Marseilles, he went on to become one of the greatest footballers ever, winning all major prizes at personal, club and country level. He has enjoyed a successful start to his managerial career with Real Madrid. His modest character has endeared him to the wider public. One of the German 2014 football World Cup winning team, the Arsenal playmaker is of Turkish descent was awarded the Bambi award in 2010 for being a prime example of successful integration into German society. He has a massive social media following and recently received plaudits for donating his world cup winnings to children undergoing surgery in Brazil. The player is a well-recognized Muslim who has stated that he recites the Qur’an before matches, prays regularly and fasts. Sonny Williams is an international rugby player, and current heavyweight boxing champion of New Zealand. Williams converted to Islam in 2008, and is the first Muslim to play for the legendary All Blacks. In 2013, he was judged the world’s best rugby league player at the annual RLIF Awards. He memorably gave away his world cup winners’ gold medal to a young supporter just after the 2015 final. With 2016 being an Olympic year, the “Muslim 500” also included a list of Muslim medal winners from Rio — which, realistically, may include some non-practicing Muslim medalists from Muslim-majority countries, or athletes with Muslim-sounding names whose religion is not public knowledge. Sports is an integral part in nation building. Apart from promoting good health and healthy life style.. it also promotes friendship and teamwork. Islam is a religion of tolerance & peace and teamwork and sports fits like a glove in a Muslims daily undertakings .